A Digital Meat Thermometer Could Save Lives! So Why Do You Need a Meat Thermometer? Provided a quick, easy and accurate temperature reading. What meats need to be cooked through? If meat has not been cooked through it can be dangerous. All uncooked meats carry harmful bacteria on the outside. Poultry, rolled joints, beef, sausages, pork and any meat that has been minced or skewered. All whole cuts present with bacteria on the outside only, however, if meat has been skewered or minced the bacteria has a chance to move around. Is eating undercooked meat dangerous? Consuming food that has not been cooked through can result in food poisoning. Symptoms can include nausea, vomiting, diarrhoea, stomach pains, chills, feeling weak and headaches. 5.4 million Australians suffer food poisoning each year. 120 of those actually die. How will I know when meat is cooked to a safe temperature? How long should meat be cooked? Cook a 2cm-thick piece of steak for 2-3 minutes each side for rare, 4 minutes each side for medium, and 5-6 minutes each side for well-done. Turn the steak only once, otherwise, it will dry out. For fillets or steaks, use a ruler to measure the thickness of the fish before cooking, then bake, uncovered, in the preheated 450 degrees F oven for 4 to 6 minutes per 1/2-inch thickness of fish. As a guide, a 1.5kg whole stuffed chicken takes about 30 minutes per 500g of weight to cook in an oven preheated to 180°C. When the chicken is cooked, cover it with foil. Set aside for 5-10 minutes to rest before carving. It appears everything can now be operated from your phone, so why not your BBQ? You can now monitor, manage and perfectly smoke your food directly from your smart phone. 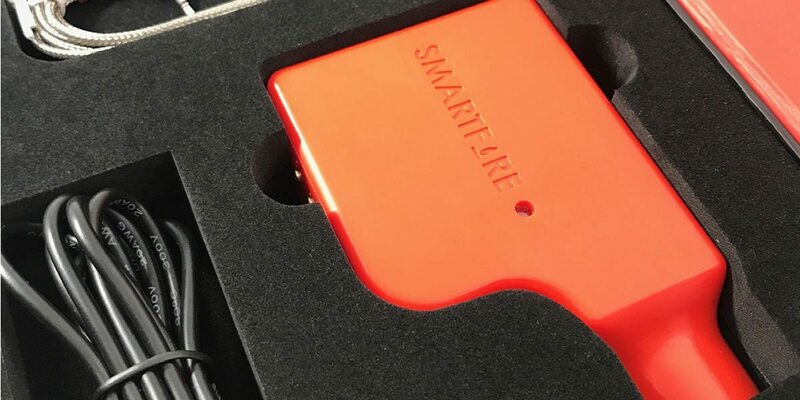 The Smartfire BBQ device will control the temperature of your BBQ by regulating the smoker airflow. It will also alert you when your food is ready. That’s right, you no longer have to be home to make sure your flame doesn’t extinguish. A new design in meat thermometers is the Weber iGrill. With technological advances in just about everything, why not the trusted meat thermometer? Weber have incorporated a temperature monitor that can be controlled and monitored on your smartphone via Bluetooth. This long-lasting weatherproof metal probe clips onto your grill grate to provide exact ambient temperature tracking. Check out our range of digital meat thermometers here.